Catered to suit your needs, we can design a one-of-a-kind experience for your group, school class, private celebration, or workplace team-building workshop. Please call or email us today to set something up! "NOCA Glass was a great addition to our summer program. Amanda and Joni welcomed us into the space, were incredibly knowledgeable about the process, and took the time and care with each student. Combining humor with detailed instruction, NOCA is the best for students of all ages. It doesn't matter if you're new to the craft or a local artist - everyone is welcome at NOCA." 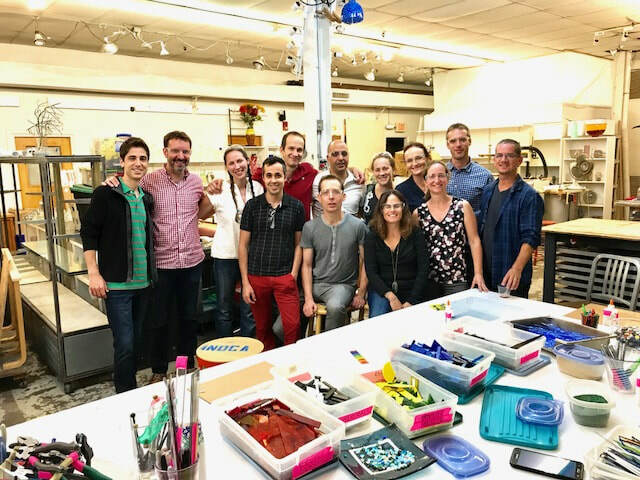 ​"I was thrilled to bring a group of 16 adults to NOCA glass studios recently for a fun night out or creativity and bonding. The group is made up of international graduate students and their partners and the evening took place at a time when they really needed a break from the academic setting - coming to the studio to engage the right side of their brain and be social was just the thing. The staff was wonderful in every regard - from helping us with the food order and set up, to giving such clear instructions for our glass fusing session. And the space is bright and very easy to work in. We all came away with beautiful glass window hangings - and with a wonderful experience that we would all be happy to repeat (and hopefully we will!)."